In what The Guardian calls “the worst manmade environmental disaster since the BP gulf oil spill,” vast swaths of vital forests in Borneo and Sumatra are being consumed by fire. These fires were intentionally set by palm oil and paper companies, simply because slash & burn agriculture is the cheapest, fastest way to clear land for plantations. But these fires in Indonesia– tens of thousands of them– are raging out of control due to record drought throughout the region. In places like Pematang Gadung and Sungai Besar, where the forests are filled with orangutans and other endangered species, some animals have died from smoke inhalation, while others have been poached or abducted into the illegal wildlife trade. But a precious few are being rescued by non-profit organizations such as International Animal Rescue. But it’s not just animal life that’s endangered: The toxic haze from Indonesia’s fires has created a thick layer of smog over the entire country. The city of Palangkaraya has become one of the most polluted places on the planet, and locals are literally choking on the devastating effects of unchecked corporate greed. Experts believe the impact of carbon released from these burning peat forests on climate change will be catastrophic if something isn’t done soon. 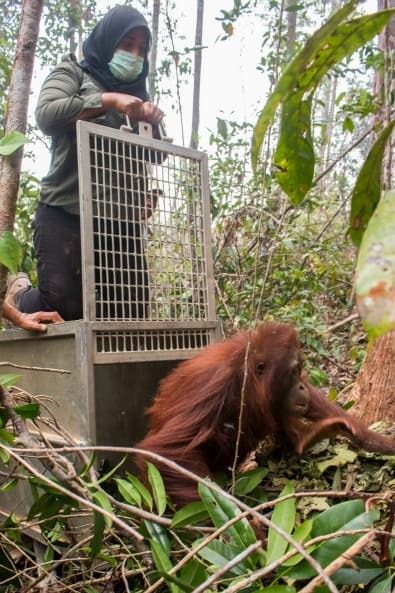 Last week IAR sent out a desperate plea for help drawing international attention to (and financial support for) their fire-fighting and orangutan rescue efforts. To get a boots-on-the-ground insider’s perspective on the struggle, we spoke to Karmele Llano Sanchez, Program Director of IAR’s Indonesian initiatives (Yayasan IAR Indonesia). Let’s start off with a little background on International Animal Rescue. Can you tell me about the organization’s mission? It’s important to separate IAR from Yayasan IAR Indonesia. IAR is the UK chapter, while YIARI is a separate Indonesian organization affiliated with IAR. I co-founded YIARI with several others in 2008. We established a rescue and rehabilitation center for Slow Lorises and Macaques in Bogor, on the island of Java. These animals are traded heavily in markets here, and have been overlooked in conservation and animal welfare efforts. We began working with orangutans in Ketapang, West Kalimantan in 2009, and established the first orangutan rescue and rehabilitation center in this province. We have so far rescued more than 150 orangutans. The aim of both centers is to rescue animals of these species and try to return them to the wild after rehabilitation. But our main goal is to ensure the protection of wild animals and their habitats in order to stabilize their populations in the wild. Can you talk about the issues currently facing Indonesia’s endangered orangutans? Orangutans are seriously threatened by the composite effect of hunting, logging, conversion of habitat for timber, rubber and, especially, palm oil plantations. We provide a rescue service for orangutans, providing sanctuary for those unable to be released, rehabilitation for young orangutans and those suitable for future release, and direct translocation for wild orangutans who need to be moved from one area of forest to another. As with our other projects, we focus on law enforcement and education. We have a strong community element to our work, working with local people in areas of wild orangutan habitat to establish community forest patrols, ecotourism and alternative livelihoods. We also have a Human Orangutan Conflict Response Team, which responds to instances of conflict– typically orangutans leaving degraded forest areas and moving onto farms in search of food. 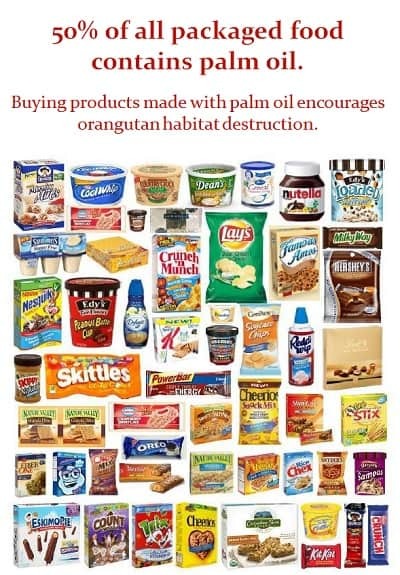 Not many people understand the connection between the rise in palm oil and the destruction of Indonesia’s orangutan habitat. What changes have you seen in the rainforests there since you launched YIARI? Orangutans have been the focus of conservation efforts since the late 1960s and early 1970s, and the greatest threat was traditionally hunting, logging and forest fires. Illegal logging was at its height in the late 1990s, after General Soeharto resigned as President and the country underwent a massive period of decentralization. Industrialized agriculture has been an important part of Indonesia’s economy since the 1980s, and large tracts of forests were cleared to make way for rubber and palm oil plantations. 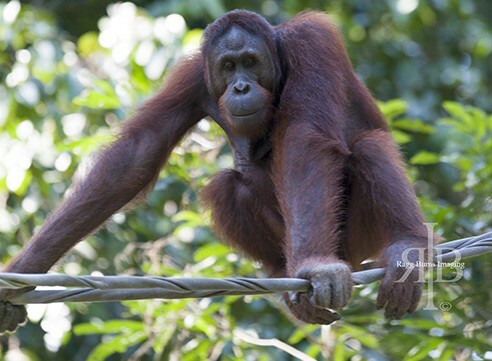 But it’s only in recent years that palm oil has become the largest threat to wild orangutans. Massive amounts of lowland tropical rainforest– the orangutan’s preferred habitat– have been cleared in Sumatra and Borneo to make way for the crops. In Ketapang, we’ve seen a steady increase in the numbers of orangutans in need of rescue. Up to 75% of the wild population is distributed in non-protected areas, which are mostly used for the development of industrial agriculture, logging and mining. So orangutans are under a lot of anthropogenic pressure. 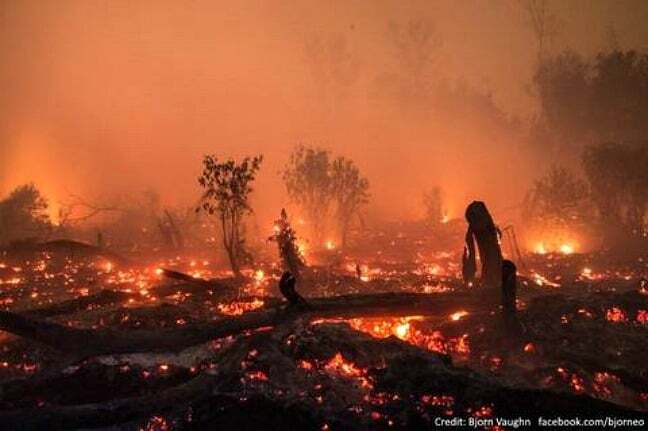 But the main threat right now is the forest fires raging throughout Borneo, in both non-protected and protected areas. They’re very difficult to stop because of a long-lasting drought caused by El Niño. This will decimate the numbers of orangutans in the wild and, if it continues, put them at serious risk of extinction. Your website says, “The plight of the orangutan in Indonesia has reached a critical stage.” How did things got to this critical juncture? As mentioned, there are a number of threats to orangutans. Different organizations focus on combatting different issues in different areas to protect wild populations. To combat hunting, we work with law enforcement agencies and local communities to reduce habitat encroachment and the economic benefits of the pet trade. We’ve collaborated with agro industries and palm oil companies to encourage them to protect High Conservation Value areas on plantations and help manage wild orangutan populations. We often do this in difficult environments, and can only do it with support from local, provincial and national government departments. Lack of funding, lack of infrastructure and corruption make this difficult. Despite our best efforts, tropical forest is still given to companies to establish plantations. Even in our national parks, companies still routinely break the law, orangutans are hunted, and locals encroach into the forest. When fires are burning out of control and you see orangutan habitat being destroyed, it’s difficult to see how many of these small populations can survive. Even if we could rescue them all, there’s not enough rescue center space for all of them, nor suitable forest in which to release them. Even in national parks– which should, legally, be safe havens for wildlife– fires are burning out of control. The largest populations of wild orangutans, in the Sebangau and Tanjung Puting National Parks, are severely threatened. The orangutan plight could not be more critical. I really hope the international community and the governments of western countries do not turn their eyes away. Once the orangutans are extinct here, they’ll disappear from the face of the earth. And these fires will affect all of us, because of the massive carbon emissions that will affect the global climate. How did these fires start, and how much land is currently threatened by them? Fires are started sometimes by industrial plantations who log the area, then start fires to clear the land, which is illegal. Or by locals engaging in slash & burn agriculture. They’re spreading out of control, exacerbated by the unusually long dry season we’re having. It’s difficult to estimate the amount of land currently effected. Reliable data will only be available once the fires are extinguished and we can do on-the-ground and aerial surveys. The forest fires of 1997-1998 are estimated to have burnt around 5 million hectares of Indonesian rainforest. These current fires are the worst our staff have seen since that time. You’ve been working to rescue orangutans from fires for weeks. 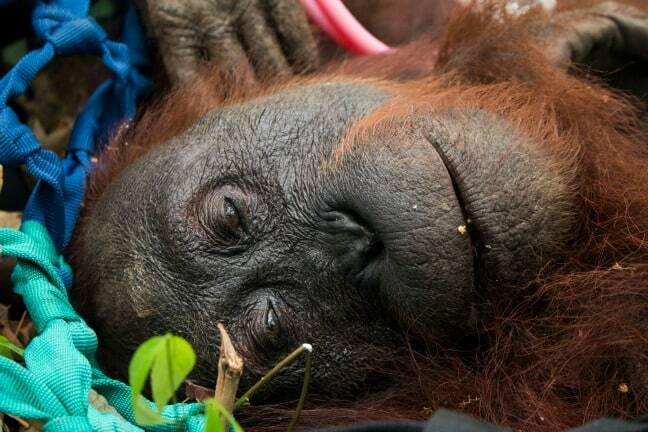 Can you describe the situation on the ground, and take us inside an orangutan rescue? The orangutans are in serious threat. When they don’t have anywhere to go, they’re at risk of burning. Even when they survive the fires, they’re often left in burnt forest where they can’t find food and may starve to death. Sometimes they enter plantations or villages in search of food, and they’re hunted, caught, and killed by people. The only way to save the orangutans is by rescuing them and bringing them to the safety of the centre (if they have injuries or are malnourished) or to the wild (if there’s protected forest where they can be safe). At the moment this is difficult, because nowhere is safe from fires. Rescues are always stressful– risky for the animals and risky for the people. It requires an experienced team that understands their behavior and knows when to take action. The orangutans must be sedated with a dart gun. The vets calculate the dose and a sniper conducts the darting. The sedated orangutan will fall from the tree, so there has to be a team of people holding a net. These rescues are often a life-or-death situation because they’re considered the last choice when it’s clear that the orangutan will not survive otherwise. How can concerned wildlife lovers help? The most important thing we need at the moment is funding. We’re using simple equipment like water pumps and water sprayers to put out forest fires, but we need to invest in proper fire-breaking equipment. Once the fires are out, when the rainy season comes (which experts say could take months), we’ll have to assess the areas that have been burnt and can be reforested, and we’ll need funds for that. Locals normally burn their land to prepare for the next crop rotation. This practice is ingrained in rural Indonesian culture. To prevent this happening in the future, we’ll need to conduct awareness activities on prevention, such as training farmers in the use of organic farming techniques in which the land does not need to be burnt. How else will donated funds be used? Does your team actively fight fires, or is it more to pay for orangutans’ medical care, or both? Both. We currently have teams putting out fires using water pumps and portable sprayers. We’re looking for more people that can help with this risky task, but we need to pay their salaries and handle all the logistics, food and transportation. 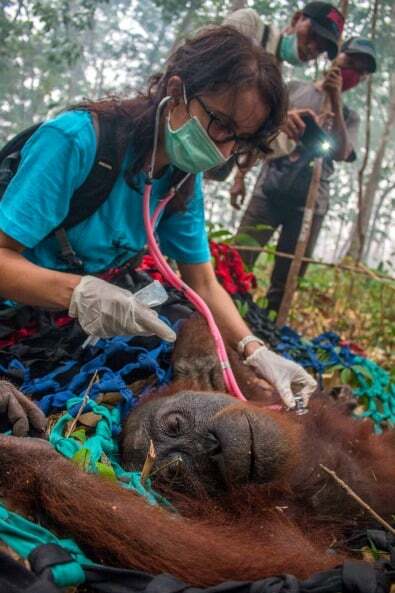 We also have people closely monitoring orangutans put at risk by fires, or who lost all their forest and are looking for food in farms and villages, and are therefore at risk of being killed. Our teams are severely overstretched, and we need more staff members to assist with this. As the fires keep spreading, we’ll need to expand these activities to more areas. We also use funds to cover the costs of rescues and our veterinary team. In October we were been called to eight rescues, and our team is currently surveying another area. We anticipate that we’re going to be called more and more. It’s likely that these orangutans will need to be brought back to our centre, and possibly treated for skin burns and respiratory problems. Tell me a little more about your Orangutan Rescue & Rehabilitation Centre. The centre’s in Sungai Awan in Ketapang, and covers 100+ hectares. It includes a quarantine facility, clinic, cages, office, staff house, and two forested areas where orangutans (divided by age groups) go out to play and develop the skills necessary to thrive in the wild. Baby orangutans normally learn survival skills from their mother, but orphans must learn from other orangutans. The rehabilitation centre is like a “forest school” for these orphaned babies. Our caregivers spend all day with these orangutans in the forest, so we need two to three shifts of people daily, because all orangutans must be under the watch of our caretakers and vets. 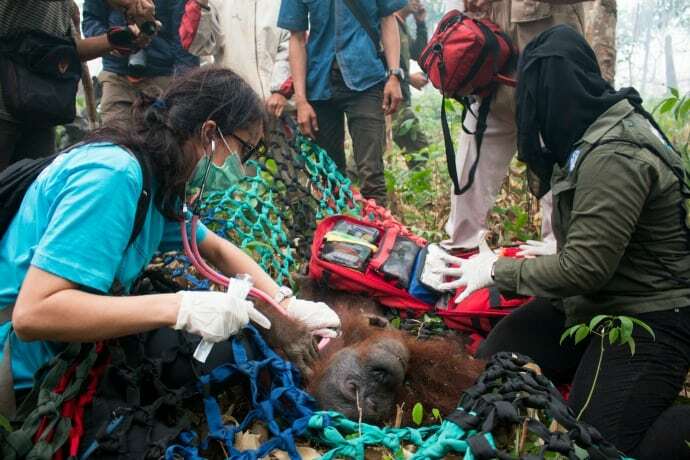 Veterinary care is very important because orangutans living around people often get their diseases. To avoid transmission to other orangutans, they go through a quarantine period. Babies are highly prone to infection from human pathogens like malaria, dengue, typhoid or intestinal parasites, so often they need 24-hour intensive care. Even after rehabilitation is over and orangutans are ready to be released, the process does not finish. All orangutans are closely monitored post-release, and teams of people will have to do this task daily from dawn to dusk. We’ve worked hard to establish suitable release sites, and currently have three in West Kalimantan where orangutans can be released or translocated. What hopeful signs do you see that things will improve for orangutans? Their plight is very critical and the situation doesn’t seem to be getting better. But we must keep our hopes up, otherwise we wouldn’t be here. We must believe that more people will care about this situation and try to help in every way they can. Our way of life in the west is directly impacting these orangutans. This palm industrially planted in Indonesia goes to western markets. We must change our way of life if we want to protect the environment. We must push the oil palm industry to stop forest destruction. We won’t be able to save the orangutans if the private sector– the oil palm industry– does not take an active role in conservation and minimize the devastating effects of their business activities on the biodiversity of Borneo and Sumatra. We need support from all governments and from the international community if we’re going to stop a serious crisis that could drive the orangutans towards extinction. –by Bret Love; photos courtesy International Animal Rescue unless otherwise noted.